February 5th is World Nutella Day, and I’m hurrying to get this post published before the day ends! 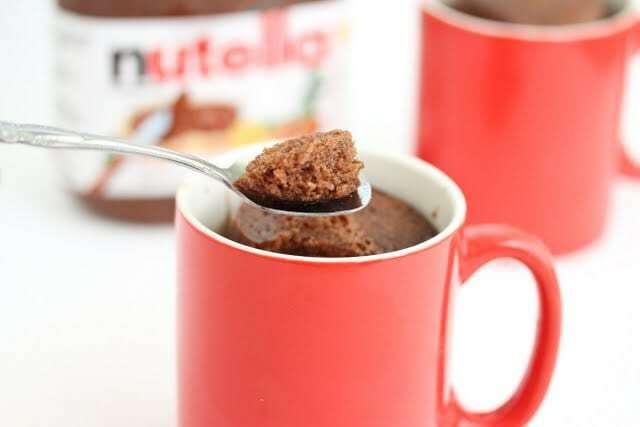 Now you might be thinking I’ve already done a Nutella mug cake, but actually, I haven’t. The Nutella flavor really comes through in this cake. 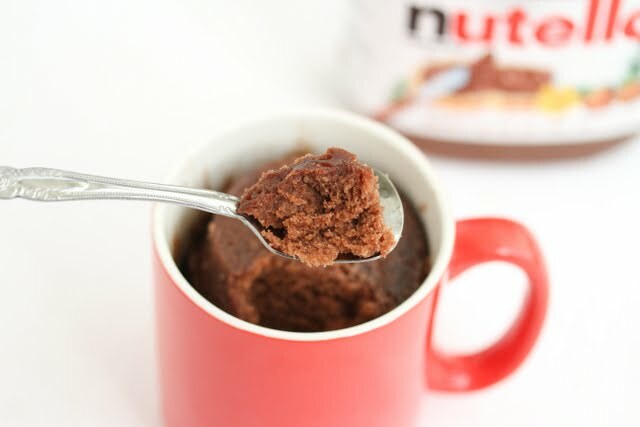 Like all my other microwave mug cakes, it’s super easy to make. Mix everything in one cup, microwave for about 1 1/2 minutes and you are done! A steaming hot, made from scratch cake. Happy World Nutella Day! 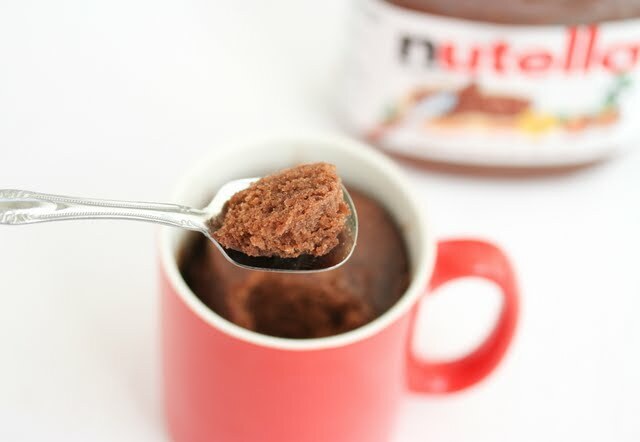 This Nutella mug cake takes less than ten minutes and is the perfect treat for one. Combine all ingredients in an oversized coffee mug. Whisk well with a small whisk until smooth. Microwave on high for 1 1/2 minutes and then take it out to check to see if it is done. If not, microwave for another 30 seconds. You don’t want to overcook it or it will become rubbery. You can also make this into two smaller-sized mugs. You can mix the batter all in one mug and then pour half into another mug. Make sure you cook each one individually. Great! You should try the brownie one too. The nutella isn’t mixed in but the texture and flavor one is a little different and really yummy. I’m working on trying to create a pure nutella brownie cake. You’re a wizard with these mug cakes, much to our benefit!! Lovin’ them. 🙂 They’ve been so delicious! Hey Kirbie I just tried making a mug cake on my own, it was like a chocolate chip mug cake. You have inspired me! Ooh, chocolate chip. I will have to add that to my list! awesome! i have so much nutella and thanks to you, so many recipes to choose from! I cannot for the life of me stop making these mug cakes! My stomach thanks you for the constant inspiration your blog never fails to provide. Aw, I’m so glad you are enjoying them! I have many more ideas to come! I was wondering if I could keep half the batter in the fridge and use it later. Will it be okay or will it ruin the cake? Hey Kirbie, I tried making this recipe twice, but both times it turned out a little rubbery. Am I just leaving it in the microwave for too long? Hi Sarah, Yes it definitely sounds like it’s been in the microwave too long if it turns rubbery. Try taking it out about 30 seconds earlier. The cake will also continue to cook a little as it cools in the mug too, so if it looks just about done, it should be taken out. Hope this helps! PLEASE DO BANANA MUG CAKE!!! What a great suggestion! I love banana cake. I’m on it! So glad you liked! This one is one of my favorites. I recommend you try the flourless nutella one too. 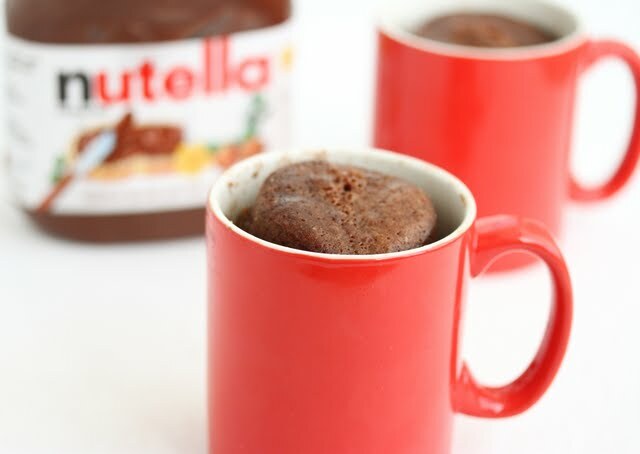 Just came across your website and found your Nutella mug cake! It was amazing and delicious I was very surprised at the taste because I am gluten free so I had to use gluten free flour. Tasted superb and I was craving for more! Best mug cake to celebrate a birthday! 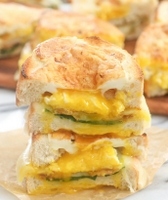 Thanks heaps for uploading this recipe! I’m so glad you like it and I’m happy to hear it works with gluten free flour. Just tried it, had to put it two minutes and it was freaking amazing! I ate the whole thing (and probably ruined my lunch). Very delicious!!! This is going down in my ”recipes to keep” book! Hi Kirbie! Thanks for this recipe! Hubby loved it when I made it for World Nutella Day last week! I made a bit of a mess though because my mug wasn’t big enough! Nice! Ooh, yeah, a little bit spillover, but glad you liked it. The mug does need to be quite big, though yours does look big. Hmm. I just checked and mine are 15 oz ones, not sure if that helps. Im sorry to bother you but could this be done without baking powder or soda ? It would be great if you had some substitutes if it is a must. Without the baking powder, there is nothing to make the cake rise. I’m not sure what you can use as a substitute. I just made this and split it into two smaller mugs, it was fantastic. The texture was just perfect. I made this recipe today! The first time it overflowed and it was a bit of a mess, but I tried it again. I split it in two mugs and it was just perfect. I loved the texture, and the flavor was very rich (I added a little cocoa powder too). Cheers from Argentina! Glad you like it! Yeah this one rises a lot so you either need an extra large mug (like 16 – 18 oz) or split into two like you did. Oh wow! This is so good! I made it in a small cereal bowl and it came out perfect! Soft sponge and gooey sauce is so yummy. This is goin to be dangerous as whenever I crave a chocolate cake, I can make it in 5 minutes! nice! It is dangerous. hehee. Now I can have cakes whenever I want. I was wondering if you can do it without the baking powder. I’ve tried many of your mug cakes, but this one is by far the most delicious one! Absolutely incredible! A 16-ounce cappuccino mug is not big enough. It bubbled up over the sides and about 3 tablespoons of batter ended up in the microwave after about 1 minute. The bonus is, after I got done cleaning the microwave the cake was cool enough to eat. Texture and flavour were amazing, other than the 1/4 inch of raw batter that remained in the bottom of the mug after 2 minutes. Next time I’ll split it into two mugs to avoid the mess, and hopefully cook it all the way through (it was verging on rubbery or I would’ve gone another 30 seconds). It might have something to do with microwave setting before too powerful, causing it to cook too fast. I didn’t have any issues of it bubbling over with a 16oz mug, but I’m glad you enjoyed it. sorry for the mess! Do you have to separate the egg or not? awesome! hope you check out some of my more recent mug cake recipes. I think they are even better! Do i have to use the white granulated sugar? Also,what type of milk did you use? Whole milk or skimmed milk?Please reply!!! Hello your cake was amazing and so tasty. I was wondering if you knew how much calories it had ? Thank you very much and have a very nice day ! Can you use olive oil??? You can try. I don’t recommend it. I’ve used olive oil in other cakes and it slightly changes the texture and flavor.